The YLAI Innovators Series podcast has launched. We just launched the YLAI Innovators Series podcast that puts a spotlight on emerging entrepreneurs who are innovating and sparking change across Latin America and the Caribbean. 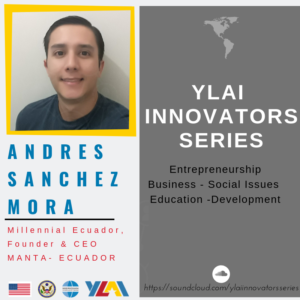 The series is part of the Young Leaders of the Americas Initiative, and serves as a platform for YLAI Alumni and Network Members to engage in discussions on advancing entrepreneurship in the region. Tune in to the latest episodes of the YLAI Innovators Series by clicking the links below – and stay tuned for more information about upcoming conversations. Andres Sanchez Mora, Founder and CEO of Millennial Ecuador. Andres is the Founder and Executive Director of Millennial Ecuador, a business consulting firm that provides young entrepreneurs with seminars, workshops, talks and services to help them develop a business plan. After returning home from his YLAI Fellowship last fall, Andres used the connections he made in the U.S. to launch a new Startup Grind chapter to support the entrepreneurial ecosystem in his home town of Manta, Ecuador. During this interview, Andres discusses the challenges he faced while creating new partnerships with Startup Grind and Google for Startups, as well as the strategies he applied to launch their chapter’s first entrepreneurship event in January 2019. Listen to this interview to hear how Andres is changing entrepreneurship for the next generation in Ecuador. Abbigale Loncke, COO of Community Healthcare. Abbigale Loncke is a serial entrepreneur who began her journey in 2013 with the establishment of Guyana’s first Home Care Agency, which today stands as one of the leading private health care employers for women. Abbigale has also founded WeLead Caribbean, a platform that supports women in business through mentorships, trainings and conferences. She recently launched and hosts “Abbi’s Power Lunch”, a television show that features women in business who are excelling in the Caribbean and shares their stories of empowerment and inspiration for women everywhere. 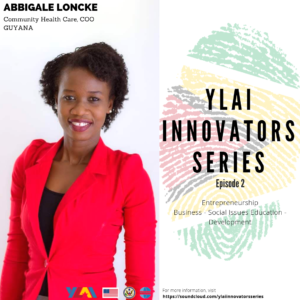 On this episode of the YLAI Innovators Series, Abbigale talks about how she sits down with women in business throughout the Caribbean for candid conversations about their successes, failures, best practices and advice on her show, Abbi’s Power Lunch. Abbigale’s show was created during the planning and execution of the 2018 Women’s Leadership Conference with a vision to extend the conversation about women in development and business, and to make it available for women throughout the Caribbean. Listen to the full interview to hear Abbigale’s insights on storytelling and women’s empowerment. To listen and read more about the amazing work that other YLAI Alumni are doing to advance entrepreneurship, visit the Young Leaders of the Americas Initiative page on Meridian’s website.